“You can run this car without a care. Cause it doesn’t run on gas, it runs on air” goes the little verse on the box. How many toys can you name, that appear to have been marketed to court the favour of the public, following a geo-political or economic crisis? And they were right. Although I’m not sure if they were bought by parents out of concern for youngsters learning the value of alternative fuel sources. Or if it was just a case of kids going “powered by air? cool!”. (Either way, parents would have loved the fact that they didn’t have to buy any batteries). Personally, I have no memory of politics in the early 1980s (aside from Australian Prime Minister Bob Hawke declaring a national public holiday when we won the America’s Cup yacht race). 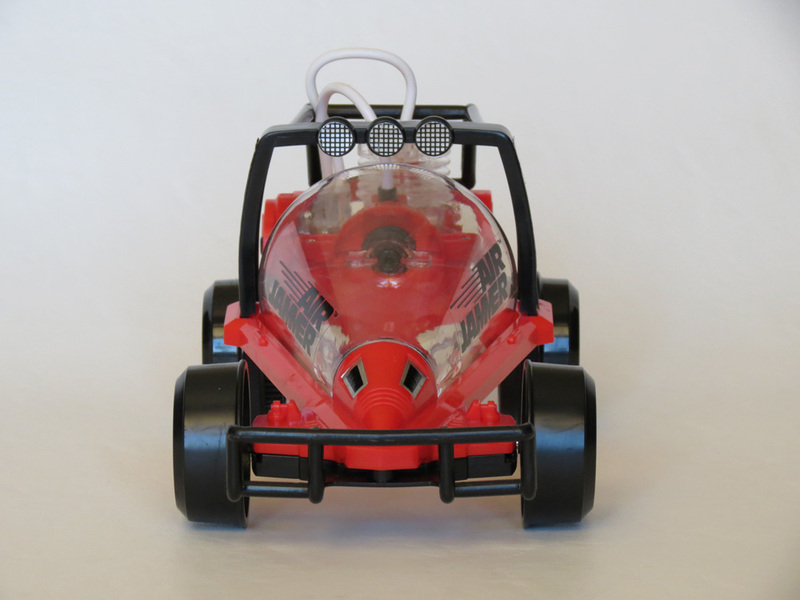 But one of my friends did have this new air-powered toy car, and we had a lot of fun pumping it up and blasting it up and down a hallway at his house! This car isn’t R/C of course, and will only run in one direction – either straight or a curve (you can manually angle the front wheels). But despite these limitations, the fun is centred on the fact that it’s basically a little car with a working air-powered engine that you can even see operating as it runs. 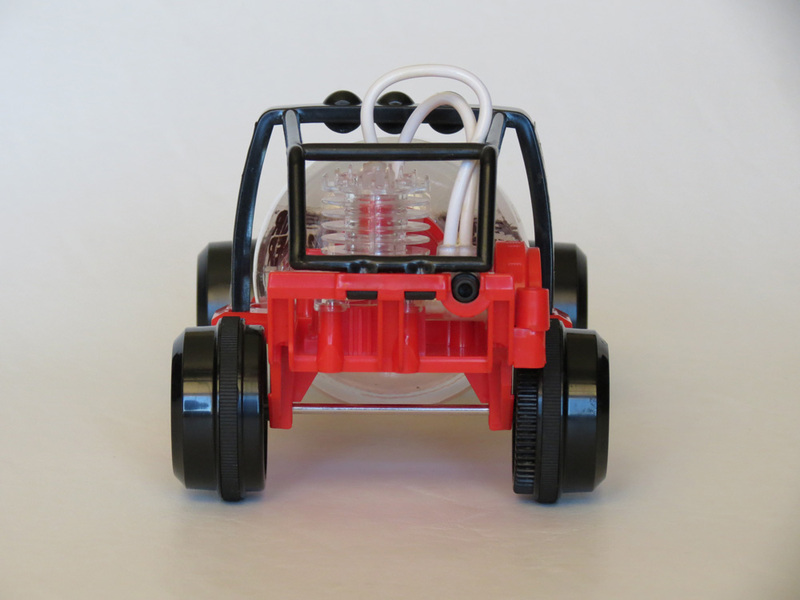 The body is an air cannister, and when you pump the car up with the little hand pump, it zooms off releasing air via an “engine” piston that can be seen bobbing up and down (and giving off a “putt-putt-putt!” sound), and which also drives the rear wheels. Even as I write this now, my brain is thinking “relatively limited play value” vs “air powered is so cool!”, all at the same time. But perhaps the real attraction of these little cars was more in how a simple concept was presented in such a beautiful way. Let’s face it, this could have been a pretty dull, forgotten toy. But instead it looked like a sort of space-age moon buggy – definitely fashionable to kids in 1980. Plus the angular shape, bumper bar, roll cage, transparent working engine and air-tubes at the back all look great too. The whole thing combined into something that certainly captured my imagination as a kid. Early versions (like the one featured on this page) have a transparent body, while later ones have an all-black opaque body. The wheels are plastic with little rubber strips for grip, and the car also came with the decals unapplied – with directions for where to put them to decorate your buggy. I say “buggy” but the instructions are also careful to point out that off-roading is not possible with this toy. You wouldn’t want to get sand inside those sensitive air shafts after all. Instead, it’s designed for scooting along on smooth surfaces – preferably with a friend who can help catch it, because it can really pick up speed. 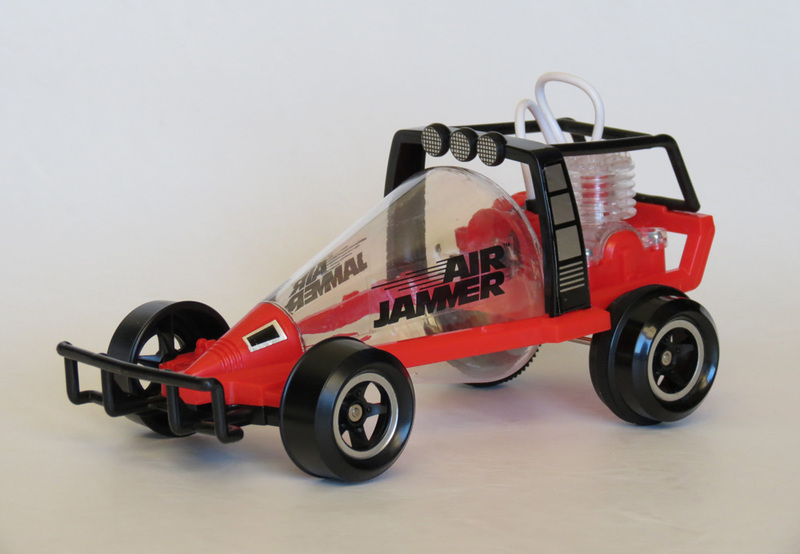 There must have been some TV commercials for Air Jammers too, but I can’t seem to find any online. (If you’ve seen one anywhere, let me know). After releasing the Road Rammer, Tomy followed it with 3 other equally cool air powered vehicles (all of which will be featured here in the future), so it’s safe to say the whole idea was a pretty good success for Tomy. 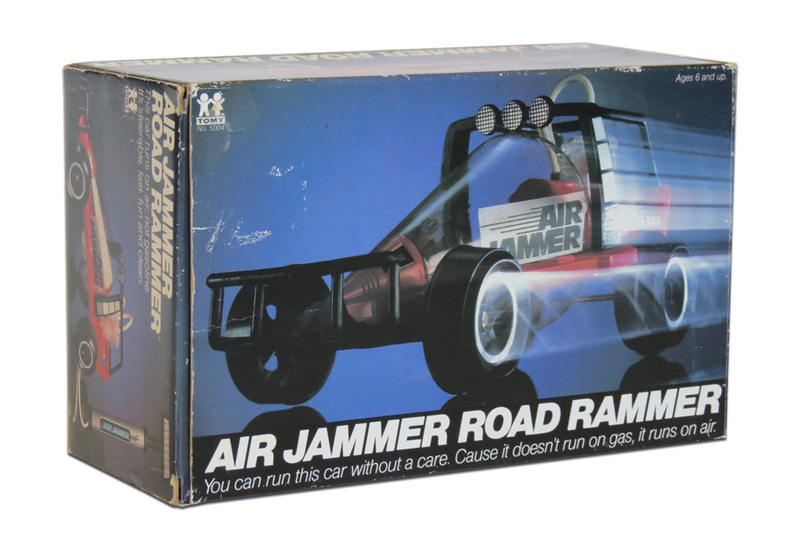 These days you can find Air Jammers on eBay and auction sites for reasonable prices in variable condition. But there are a fair few people out there who have fond memories of them and want them, so be prepared for some bidding competition. 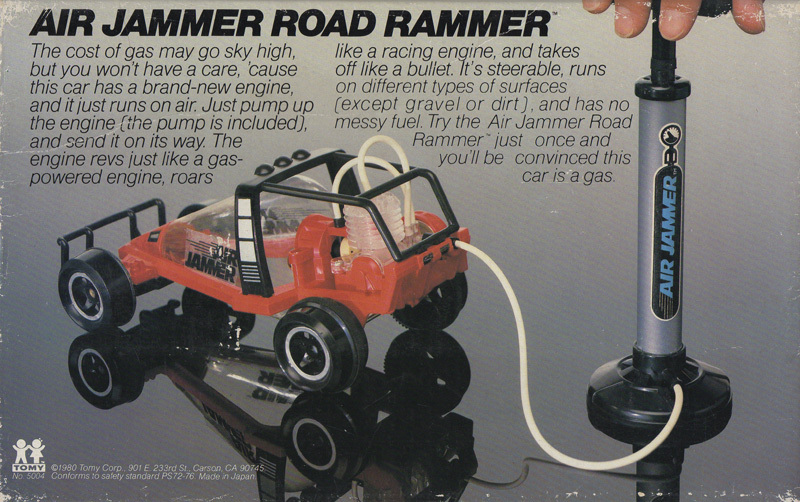 Of the various models released, the Road Rammer is probably the most common. I remember these! I also recall the tank being switched from clear to flat black. The ads were prevailant on TV but I can’t seem to find any online today either. In retrospect, what a great little concept. Its certainly very novel and fun for children of the era. Its a shame today’s toys lack any of this inspired design. I had totally forgotten about these until I saw this entry which brought it all back to me. Thanks! I was born in 1979 and I had this toy. I still remember the sound of the piston on these cars. Guess what! They are back!!! Hi Nancy. I’m not sure where specifically you’d find the right tube, perhaps a hardware or hobby store could make a special order for you. I can only tell you it’s a thin, flexible, rubbery/plastic tube that fits perfectly inside the outlet hole near the bottom of the pump, and the inlet hole at the rear of the car. If you took both items with you, any tubing available could be tested to fit. Your other option is to just be on the lookout for a spare pump on eBay. Hey nancy! Did you ever find a hose to fit your pump? I too found the car and pump with missing hose and would just love for my boys to play with such a fun toy. For replacement tubing, try plastic coated clothesline. I cut a nine-inch piece, took out the fiber cord, and wrapped about one inch of Scotch Magic Transparent Tape to increase the diameter a bit. 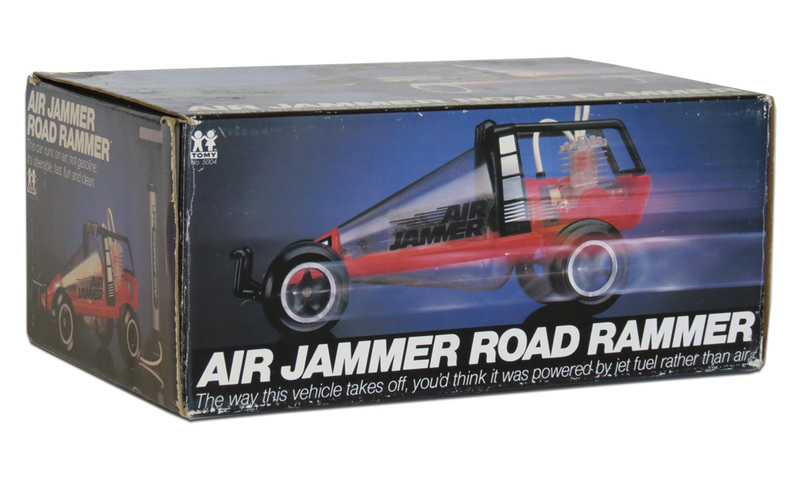 Works fine with an original Air Jammer (black air tank). 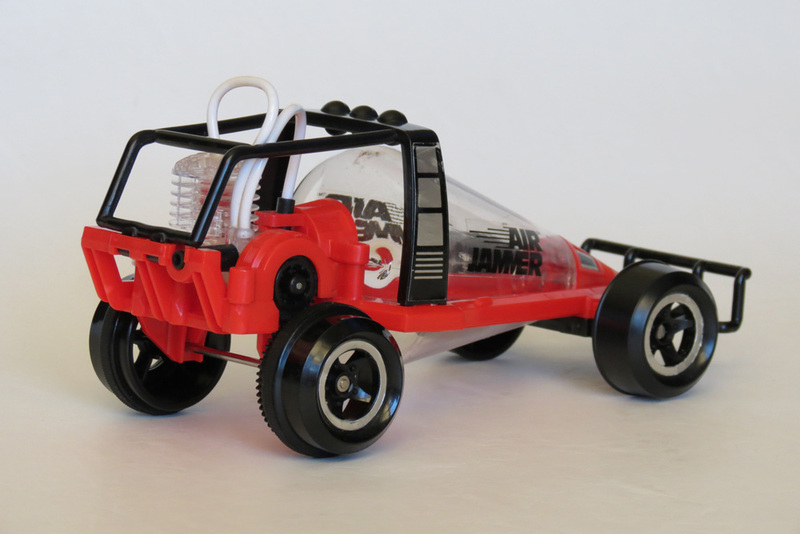 While at Toys R Us today, looking for a birthday present for a 7 year old boy, we found an “EduScience Air Jammer Buggy Kit” It IS the Air Jammer Road Rammer, but in a different color scheme, and in pieces to be assembled by the child. Not difficult, includes the screwdriver. I was SO excited, I had one over 30 years ago, and will go back and buy myself one! Thanks for that Jeff! I’ve now added it to the article. OH wow, this blog is amazing! I think I had one of these too, I believe mine was a yellow bike though? Did they make those as well? Yes, there were actually 4 models in this original series – the buggy, a VW beetle, a bike and a trike. I have them all, so I’ll have to post about the others soon. This was possibly the best toy I ever owned. I remember the plastic smell of it and the sound of the engine. My pump fell apart and my father glued it together. My American grandparents sent it to me in the UK when I was around about 4 in 1983. I had the black canister. I have seen a version on Amazon, but it looks worse and gets terrible reviews. If I could get hold of one more like the original for my son I would. If anyone knows how I can get hold of one or has one for sale, please let me know.